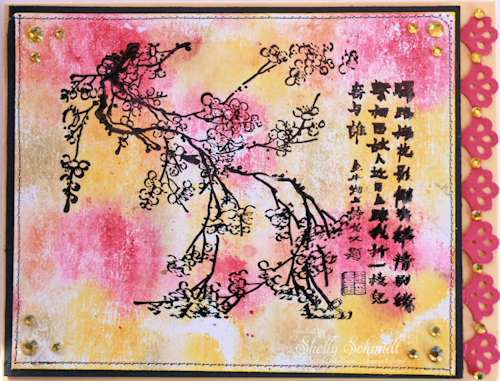 I love this image by Art Neko/About Art Accents- it is a Plum Blossom Branch and a Poem. I used a technique from the New Technique Junkies Newsletter called Smooshed Ink Blocks. I love this technique and you will most likely be seeing it again- it is a version of Polished Stone. I am a lover of Pink as well....... What do you think??? 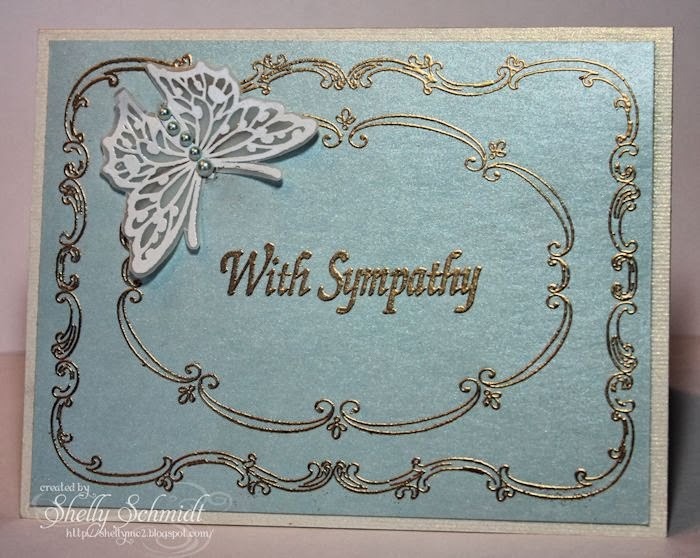 I used shimmery cardstock from Paper Temptress, and embossed the beautiful frame and sentiments in Queens Gold EP. Be sure to use the antistatic pad so the EP stays put! 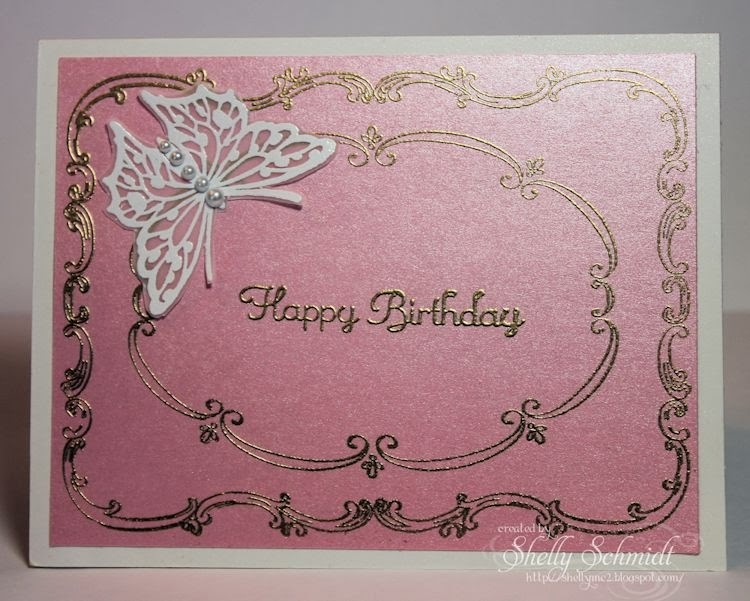 I used Parchment Vellum and White EP for the butterflies, and added pearls to the centers. I just glued down the centers of the butterflies. 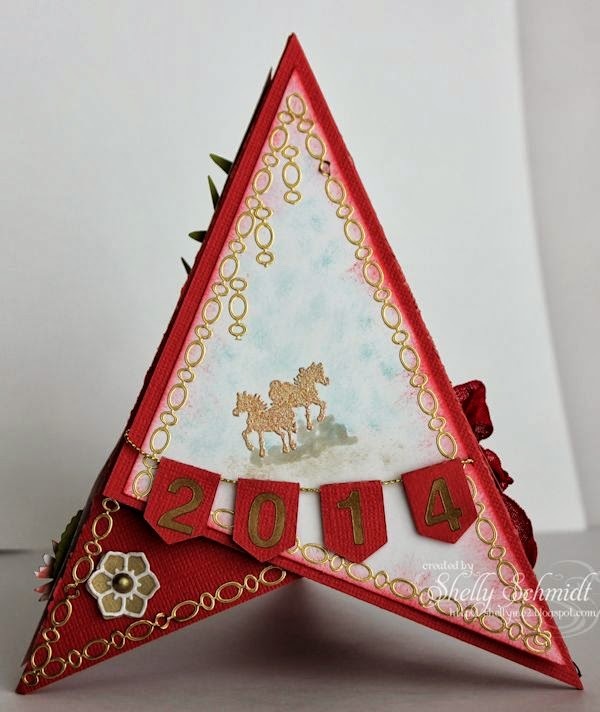 My blogging friend Lynn posted a card using this cute image and I had to go snag it from Deedee's Digi's. This is a challenge where if you post a card with a digi, you get next month's for free. The image is pre-colored which really made it fast and easy! The sentiment (Happy Belated Birthday) and more of the numbered DP is inside the card. 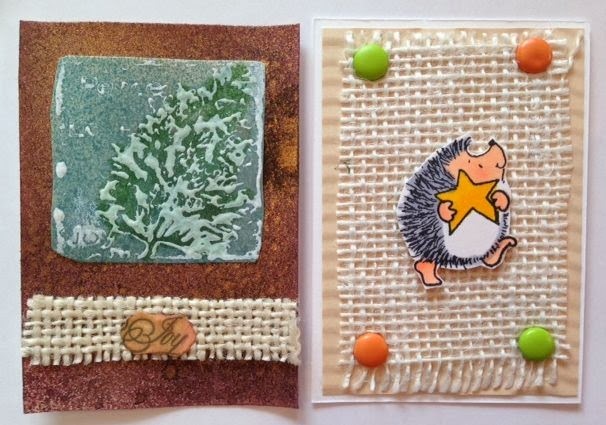 Denise nominated me for a Blog Award- Pop on over and say Hi and see her gorgeous cards!!! 2. What die cutting machine do you use and why? Big Shot- I had a Cuttlebug and it broke, so I started using the Big Shot I got at a SU party I had- love it. And, I just bought a Silhouette Cameo. 3. Do you prefer digital stamps or traditional stamping and why? I go through phases- but had a computer crash and lost a ton of digi's, so stopped using them quite as much. 4. 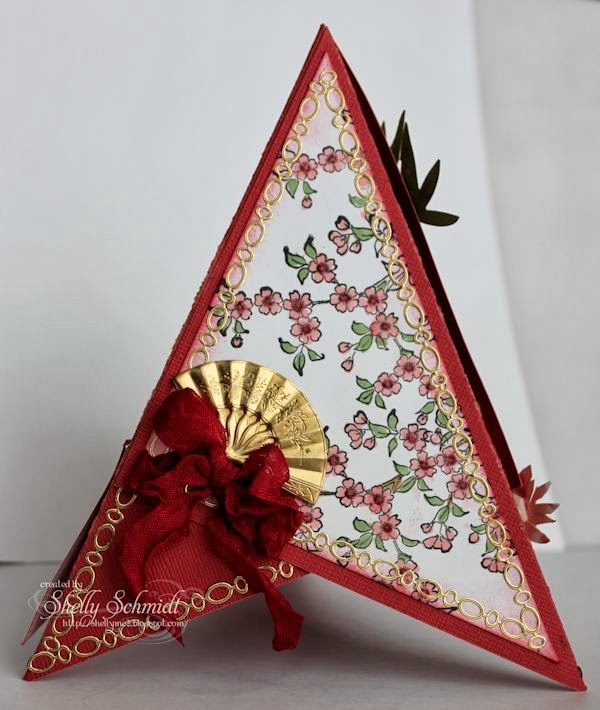 What other crafts do you do except card making? Oh I have been creafting since I was little..... I sew, smock, and love embroidery. I used to Cross Stitch alot, I knit, crochet and do dabble in beading/jewelry making a bit. 5. What prompted you to start your own blog? I decided to give it a try to join a DT for a small company that was a sponsor for Technique Junkies. 8. Do you have a craft room? Yes, it was formerly full of all of my sewing supplies, but now shares space with my stamping supplies. 9. What is your favorite crafting? Papercrafting. 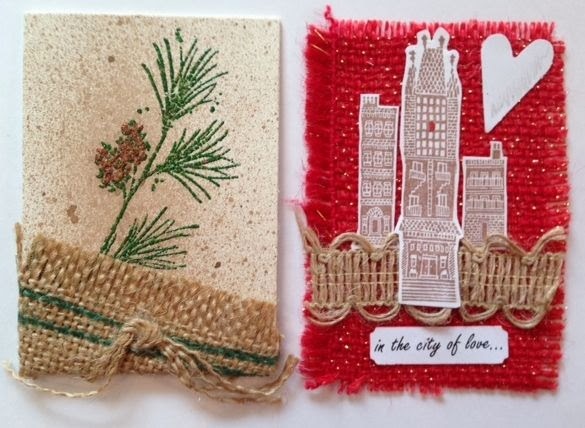 I rarely sew.........except for on my cards. 3) What is your favorite coloring method? 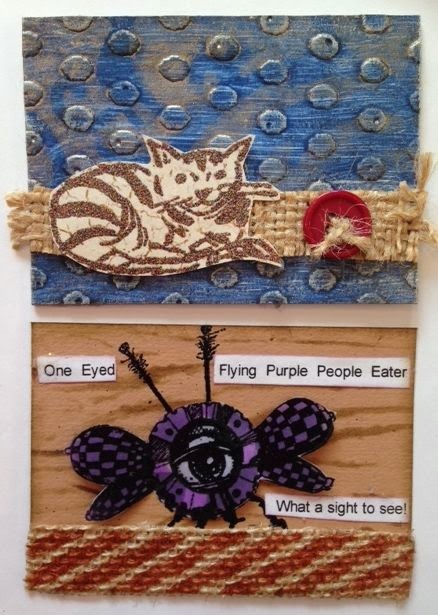 Before I left for Asia, I joined an ATC swap at RubberStamp Chat for Burlap ATC's. 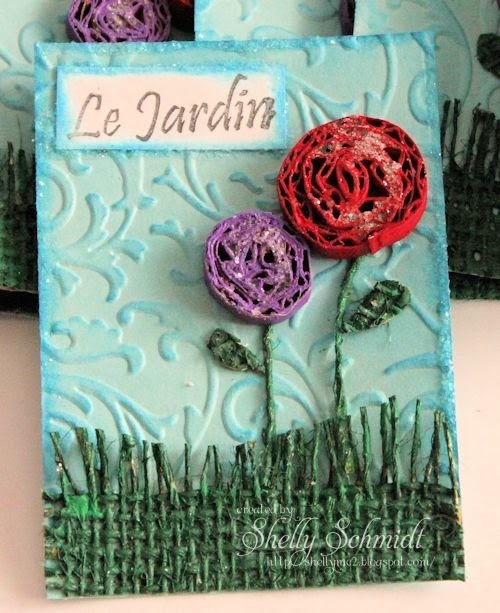 Inspired by a recycling cardboard segment on Creative Jumpstart 2014, I made these flowers and decided to use them for this ATC swap. I made grass and leaves with painted Burlap- which I learned from the Technique Junkies. The sentiment is Rogue Redhead. I added Stickles on the flowers and all around the edge of the ATC. This one would have been too time consuming to make 9 of while I was trying to pack and get everything else done! But I love the look of this! On the top- this one is not signed : ( but I will edit if I find out who made it. 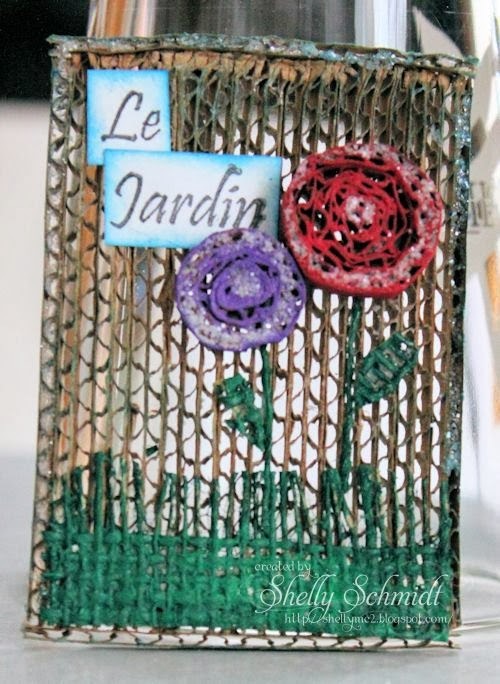 And a shimmery floral ATc from the hostess Deb Lovett. I love the fact that I knew I would be receiving some really fun mail when I got home from traveling! Hope you have been inspired! 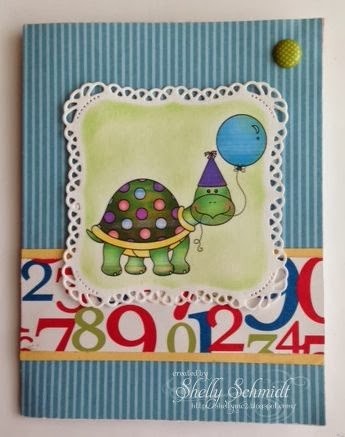 It's Tuesday -another challenge at Sweet Stamps . Our challenge theme is Anything Goes. 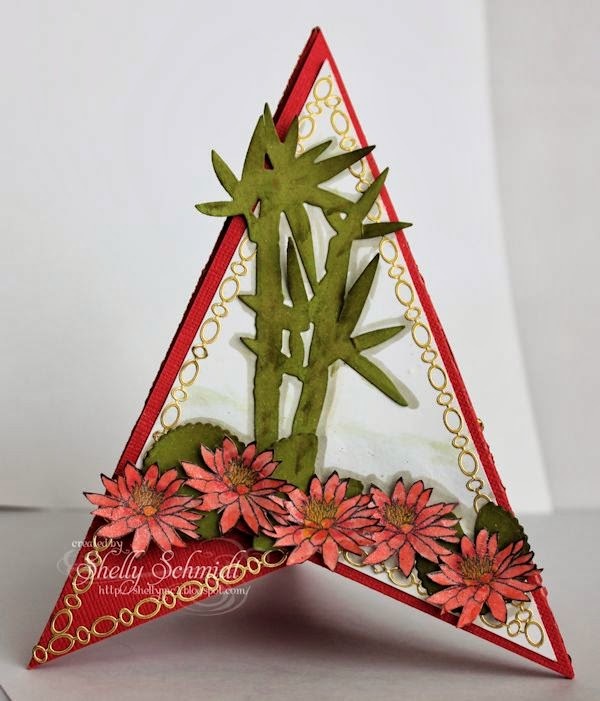 This layout is called Offset Die Cuts- I learned how to make it- yep - the latest Technique Junkies Newsletter. The most time consuming part is figuring out which die set you want to use for the grouping- and what image to put in the center of it. I inked the image with Shades Die Ink Spots direct to rubber, and stamped it onto white cardstock. I inked the image tone on tone for a watermark type look using the Aegean Spot. 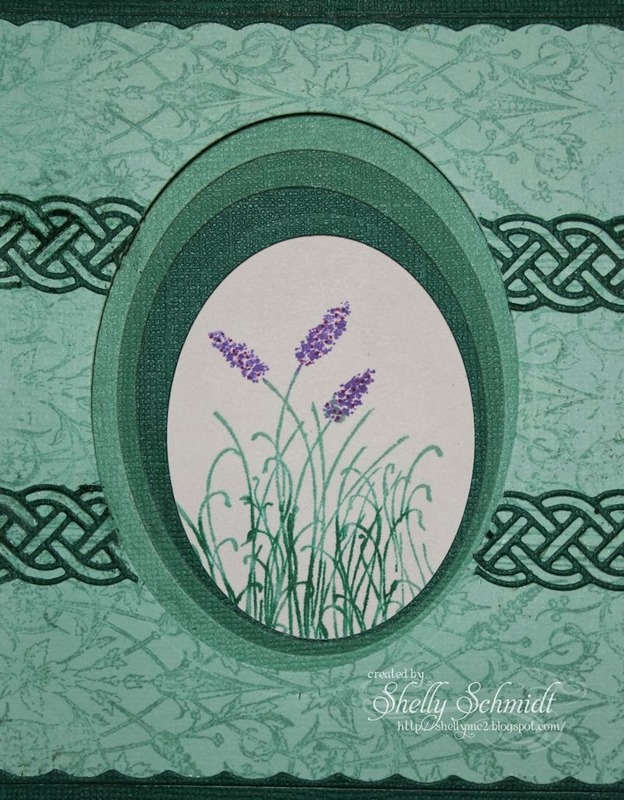 The Celtic border die was cut and the outside edges have the little scallop, so I used that on the top and bottom of the card. 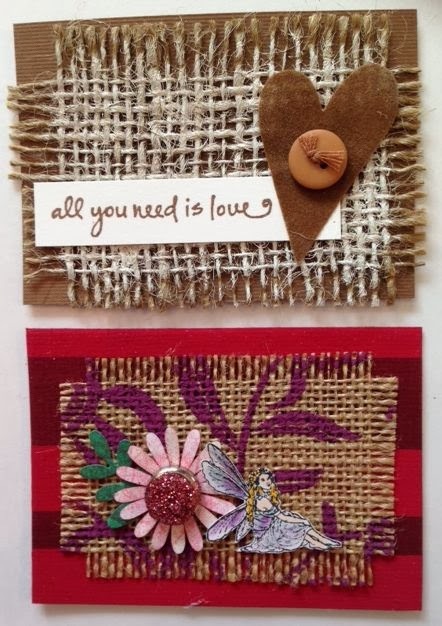 Here are the products I used making this card. so I took out a Technique Junkies CD called 3D Fun Folds and found this fun Tee Pee card. For the Chinese New Year, it is the Year of the horse. I used Medieval Metals to emboss the horse image, then stippled on color. I added gold stickers to the edges of the cardstock and added a banner with the year. Side two has Cherry Blossoms colored in Copics- I used the Tea Rose set plus (Did you know Sweet Stamps is now selling single Copic markers ? ) single markers used- E35, G24 and Y15. I added a touch of Stickles for some shimmer. The big gorgeous fan is from a local Stamp Store. I added some color to the bamboo image with a Tank spot- first direct to paper, then I used a waterbrush to spread out the color. I die cut three of the smaller scalloped circles and sponged the edges, then used them for my Waterlilly pads...... The Water Lillies are colored with Tea Rose Copics set Plus Y15 and then Creative Inspirations Fairy Dust paint was applied. This card has a spot of Velco for the closure, and lays flat for mailing. The 15th is the last day of the Chinese New Year Celebration. Here is a link about the Chinese New Year that my daughter sent to me. Really- and here are lots of interesting facts about the celebration. Did you learn anything new??? I know I did!